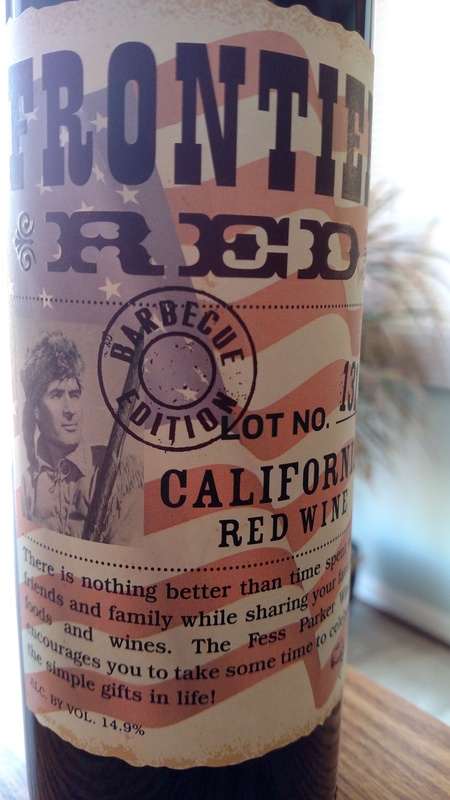 Fess Parker Frontier Red Blend (Barbecue Edition) | Wine Splash! Daniel Boone was a great American explorer and frontiersman who may have never experienced a good quality wine as this one which depicts his photo on the label. A tasty wine from Fess Parker Winery in California and is an adventurous blend of Syrah, Grenache, Petite Sirah, Mourvedre, Cinsault, and Carignane. In the glass, bright ruby red in color. Aroma’s of dark fruits, ripe black cherry, raspberry, and pepper. Medium weight mouth-feel with softer tannin notes. Vibrant flavors of black raspberry, black cherry, leather, and cranberry rouse my palate! Fruit forward but nicely balanced. On the second sip, more dark fruit flavors emerged along with blueberry and dark chocolate, leading to a soft, smoky finish. Easy drinking and a great entry level red blend. Pair with burgers, grilled barbecue chicken, pizza, medium cheeses, but NOT raccoon! Raccoon does make a cool hat though. 88 Points! Average of $12 a bottle. WineSplashing! !